James Franco takes on Tommy Wiseau in The Disaster Artist, a portrait of a filmmaker with passion to spare but not much talent to support it. Based on the book co-authored by actor Greg Sestero and journalist Tom Bissell, the film details Wiseau and Sestero’s friendship, and the story of how their 2003 cult phenomenon The Room was made. Franco directs and also plays Wiseau in an uncanny performance, one of the actor’s best, leading a comedy that celebrates, laughs at, and even lends surprising dimension to both Wiseau and his derided-yet-beloved film. But unlike the nonsensical Troll 2 (1990), another in the so-bad-it’s-good pantheon, there’s a clear personal voice behind The Room, and Franco searches for that voice (it’s a distinctly Eastern European voice that claims to hail from New Orleans). Capturing the same balance of admiration, mockery, and craft as Tim Burton’s Ed Wood (1994), Franco’s film pays homage to a cinematic rarity—a film so otherworldly in its awfulness, and such a debacle to produce, that the resulting catastrophe deserves to be admired as a sheer oddity. When The Room first opened, no one knew about its financier-producer-writer-director-star Tommy Wiseau, a narcissistic Polish immigré with a mysterious background and fluid cash flow. Behind gothic garb, several belts, long dyed-black locks, and a timeworn visage, Wiseau insists he’s decades younger than he appears. He might even be a vampire. 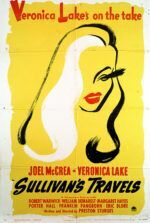 Although his independent production bombed, the film became a favorite at midnight screenings. And to crowds of football- and spoon-throwing enthusiasts, Wiseau became a cult icon. But there’s an inherent cruelty involved in the audience’s appreciation of Wiseau. They’re laughing at The Room because it’s unbelievably bad, though Wiseau infused his film with raw earnestness. 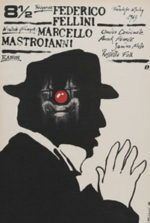 The filmmaker’s role as Johnny—complete with aching real-life parallels—suggests his vulnerable ego. No wonder he later claimed the film was meant to be an ironic cult success; accepting his artistic failure might have been a tragic blow. Wiseau bared his soul in a vanity project and people laughed, and despite the behind-the-scenes horror stories about his tyrannical behavior on-set, there’s something sad about that. And so, an unexpected touch of tragedy lurks beneath the surface of The Disaster Artist. When we first meet Franco’s version of Wiseau (behind pale color contact lenses and a prosthetic chin), he’s performing a scene from A Streetcar Named Desire in a San Francisco acting class, though the only line he seems to know is “Stellaaaaaaa!” Wiseau climbs about the stage, throws chairs, and disturbs most onlookers—except a shy, 20-year-old wannabe actor Greg Sestero (Dave Franco), who watches and admires Wiseau’s uninhibited acting. The two become best friends, bonding over a shared desire to become the next James Dean. Before long, Wiseau invites Greg to crash at his one-bedroom apartment in Los Angeles, though Wiseau’s apparently unending source of income remains a secret, and both attempt to acquire acting gigs. Greg has the look but not the talent, whereas Tommy is told he looks like a villain. But Tommy doesn’t see it that way, and so he resolves to make his own film, casting himself as the “true American hero” Johnny. 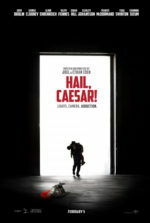 Wiseau writes “the greatest drama since the Tennessee Williams,” and plans to imbue his eventual film with the classicism of Shakespeare, the style of Hitchcock, and the acting bravado of Brando. Spending a reported $6 million of his own funds acquired from who-knows-where, Wiseau buys camera equipment (both celluloid and digital, nonsensically enough) and rents a soundstage, and then proceeds to break every known rule about how to make a movie. From his behavior that descends from primadonna to ruthless dictator in a number of days, Wiseau desperately wants to make himself appear appealing, yet remains willing to belittle his leading lady, Juliette Danielle (Ari Graynor), in the process. His worst behavior stems from jealousy over Greg finding a girlfriend (Alison Brie), suggesting Wiseau is a fragile, lonely, near-suicidal guy who works through his emotional hangups by telling a story—about a man betrayed by his best friend, no less. And while his cast and crew have no faith in the material, everyone shows up for the modest premiere, where Franco takes some liberties with the ironic and celebratory reaction. In reality, The Room took years to develop into an underground camp classic. Scott Neustadter and Michael H. Weber’s script consolidates the timeline to offer a rather heartening moment where Wiseau pretends his melodrama was always intended as an ironic comedy. Franco’s ability to make Wiseau a laughable curiosity that remains nonetheless worthy of our empathy is masterful. At the same time, Franco cannot resist the oddity of Wiseau, nor transcribing many of the funniest, strangest moment’s from his subject’s film here. Though this could have been as ineffective as explaining the punch line of a joke, Franco underscores how The Room grows funnier after repeated viewings. With more than a dozen takes of Franco’s Wiseau trying to remember his “Oh, hai Mark!” lines, dialogue that he wrote for himself, his failure to remember them never ceases to produce a laugh. Similarly, the incredulity and bafflement of script supervisor and cinematographer (Seth Rogen and Paul Scheer) add to the bewildering nature of Wiseau’s “creative” choices. Franco’s earlier directorial efforts have been largely experimental—they’re usually micro-budgeted, independent productions that barely get distribution. And thus you may be surprised to learn Franco has over 30 credits as director, including some television, documentaries, and less-than-feature-length material. He’s prolific behind the camera, though his projects remain underseen and, for the most part, unremarkable, though his penchant for great American literature (in adaptations of William Faulkner, John Steinbeck, and Cormac McCarthy) bears a similarity to Wiseau. With The Disaster Artist, Franco shows an enthusiasm for the material, along with a series of winking performances by his cast. Jacki Weaver is excellent as Carolyn Minnott, the actress whose character learns she has breast cancer in a detail ignored later. Josh Hutcherson’s role as Philip Haldiman (whom Wiseau once described as “really retarded a little bit”), the 27-year old actor who played creepy teenage boy Denny, hilariously captures Haldiman’s absurd and overemphasized facial expressions. 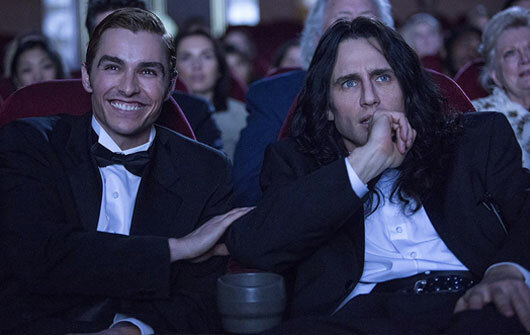 The Disaster Artist does more than chronicle The Room‘s journey to the screen or detail Wiseau’s fragile ego; it also shares in the cult celebration. It’s apparent that Franco and his cast adore Wiseau’s film—the director assembled an impressive cast of Hollywood stars, all of them fans, to take part and appear in brief cameos. But one of the more impressive sequences comes just before the end credits: Franco and his crew engage in a shot-for-shot remake of The Room, mirroring many of the awkward pause and overwrought performances in the original. For those unfamiliar with The Room, these scenes will demonstrate the exceptional lengths Franco and his cast went to mirror his subject—a technical and performative feat, to be sure. In another way, it shows a loving appreciation for the initially disparaged film. The cult audiences that revere The Room for its strangeness and downright lunacy will identify with Franco’s approach and, through his affectionate and honest treatment of the complicated Wiseau, perhaps find some measure of human sympathy beyond the usual heckling.